It is said that the first ragged school was established in Portsmouth by John Pounds from his home. 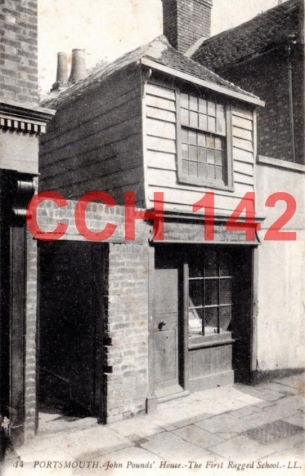 A cobbler, he started educating poor children reading, maths, cookery, carpentry and shoe-making from the workshop in his house on St Mary’s Street (now Highbury Street) from around 1818. He offered his teaching free and the classes became more and more popular. He taught up to 40 or 50 children at a time in his workshop which only measured 6 feet by 18 feet. As small as it was, this was the first ragged school. It is said that he would go to the docks and streets to find children in need and encourage them to attend his school, sometimes tempting them in with baked potatoes. Following his death in 1839, a group of Portsmouth women continued Pounds' work and started a school in Kent Road in which to education poor children. The house was destroyed during the 2nd world war, but the compensation money awarded by the War commissioners was used by the reverend John Sturges to set up the John Pounds Trust in 1957.The Trust continues to provide financial support for children's education in the Portsmouth area. In terms of the ragged school movement itself, Thomas Guthrie wrote a Plea for Ragged Schools crediting John Pounds with the idea. In the next decade more than 200 free schools for poor children were established in Britain.